A new remixer will be joining us. He hails from Olso, Norway. He has made some great remixes, which he will be sharing with us soon. 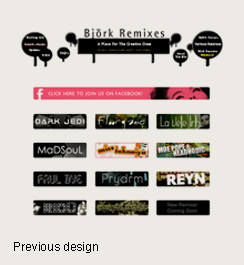 Before this site was born there was another Björk remixes site but it was called Björk Remix Web and it was ran by Hisakazu Tanaka at www.arktikos.com. It no longer exists. It would be nice to get in touch with him. His site was a huge database of unoffical remixes. This site is not a database and only holds a limited amount of remixes. 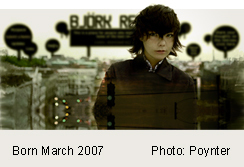 Björk Remixes (aka Tea's Björk Remix Web) was born in March 2007. This is a place for people who enjoy being creative with Björk's vocals and music. About Tea: My name is Tahnaiya Russell (pronounced *tee nee yah*) and Tea is my nickname. I'm originally from London, UK. When I first moved to America I couldn't work and do much else due to not having my greencard. So In the beginning I spent my days at home being creative, working on my web design skills and I accidentally started this site. Original songs are copyrights of Björk. Arrangements and remixes are copyrights of the remixer. Original photographs of Bjork are of the copyrights of the photographer. Credits can be found at the bottom of every remixers page.